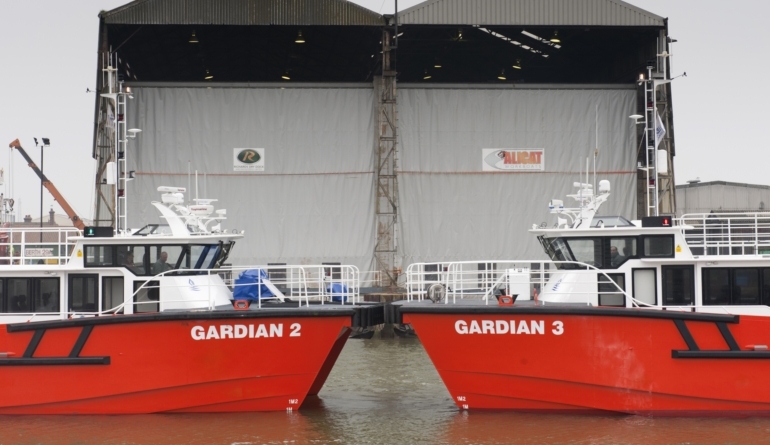 “Gardian 1″ is the pride of the Gardline Industries fleet. 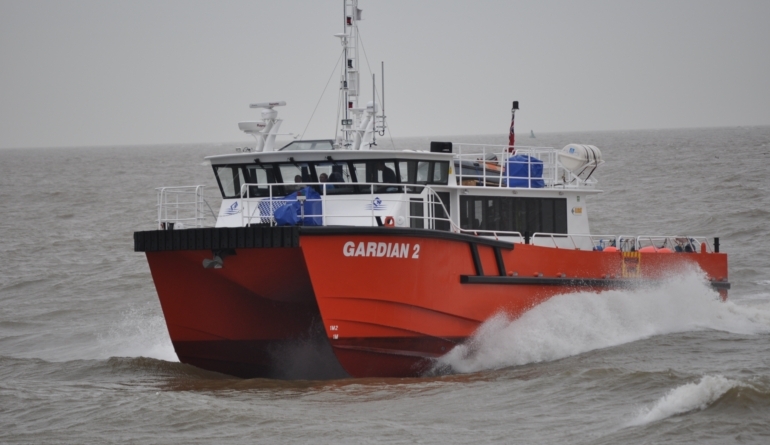 It all started when in 2009, Gardline saw a need to enter the renewables sector with Wind Farm Service Vessels. 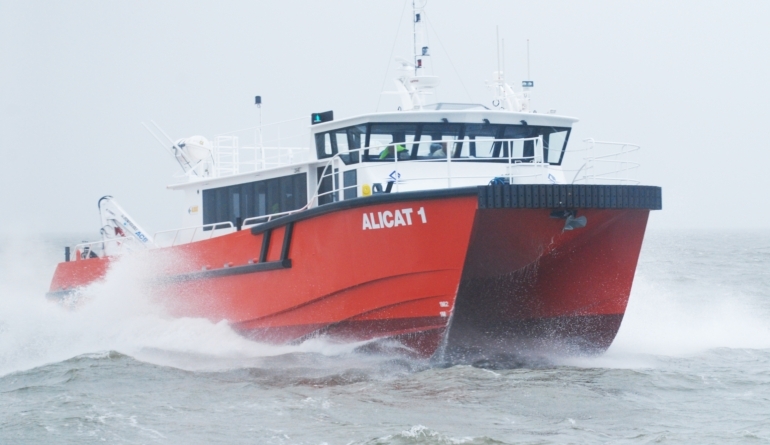 After extensive research and an impromptu visit to he Global Marine Design office in Western Australia, they chose GMD as their exclusive supplier of designs and kitsets, for building by their subsidiary Alicat Workboats, located in Great Yarmouth, UK. 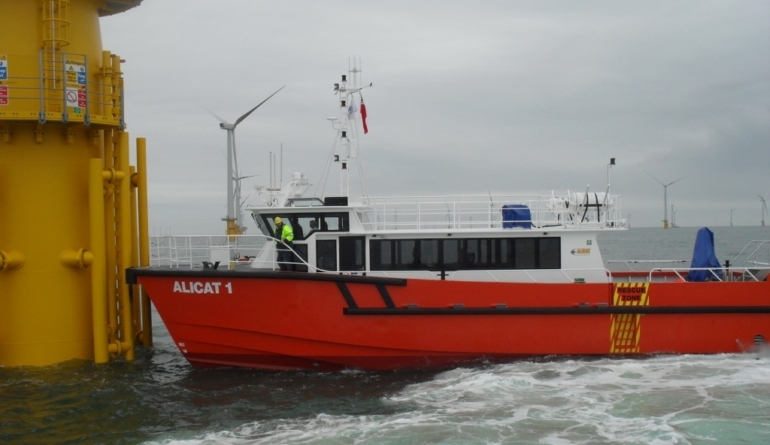 Based on our highly successful jet cat “Sea Stryder”, the “Gardian” has been specifically developed for the rapidly growing UK and European Wind Farm market and was built by UK based Alicat Workboats, a subsidiary of Gardline Shipping as their first WFSV. 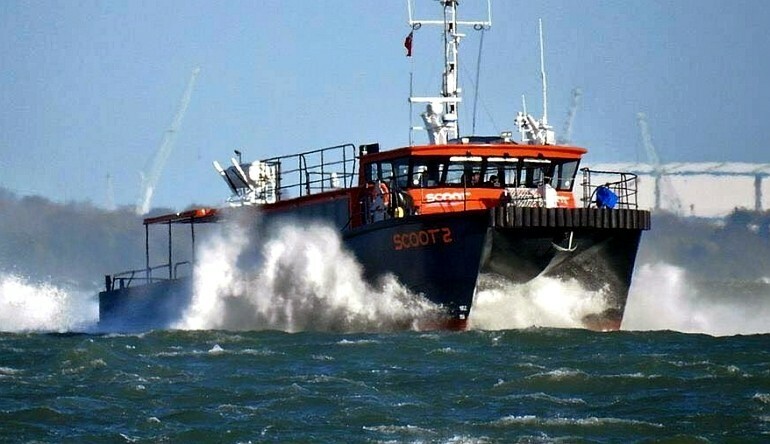 The hull is designed with foil keels and twin semi tunneled propellers and achieved a genuine 30 knots in trials off Southampton in June 2010. 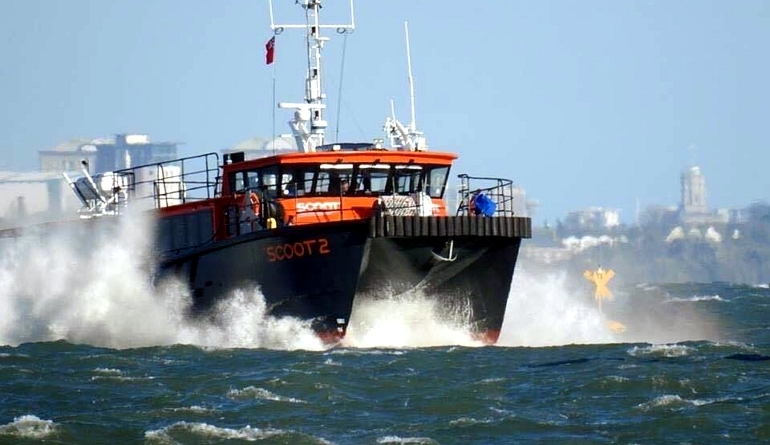 Caterpillar have since re-programmed the engines from 1800 to 2100 RPM and as a trade off we lost 2 knots off the top speed and picked up a heap of bollard pull. 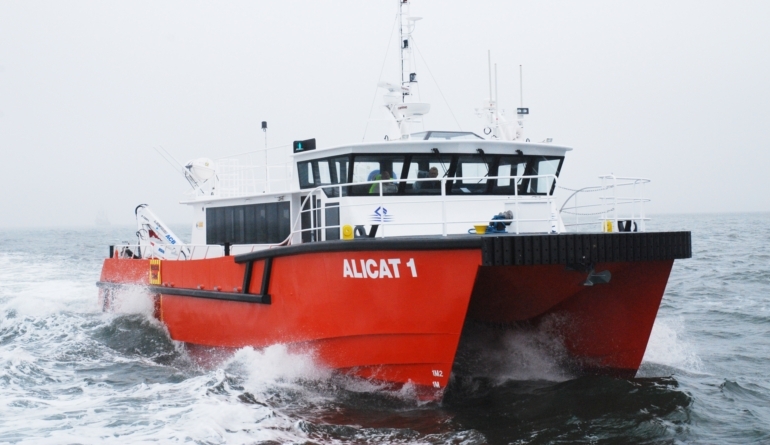 The design is fully approved to Det Norske Veritas DNV and was built to UK MCA code for Cat 2 vessels 60 miles offshore and 4 metre seas. 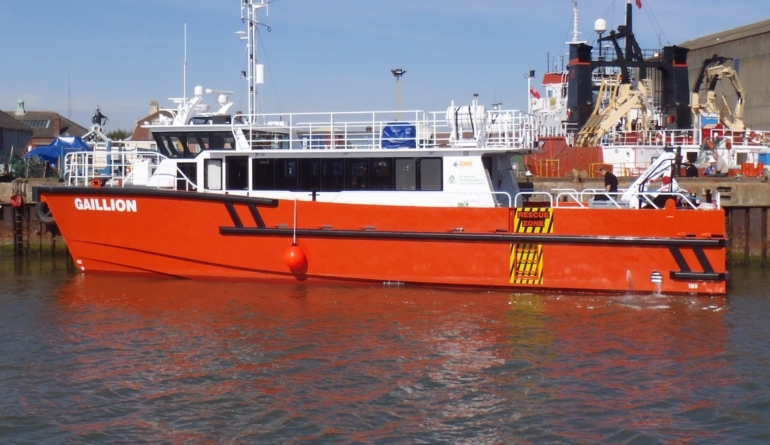 We have since had this vessel fully approved to Bureau Veritas by strong demand from the operators. 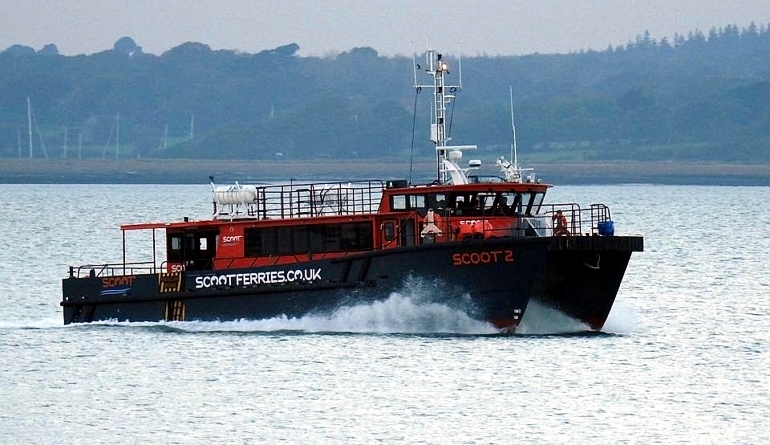 Demonstrating the versatility of this vessel kitset, two of ‘Gardian’ vessels how now been refitted and painted in orange and black livery to operate as Scoot Ferries on their Cowes-Portsmouth route. 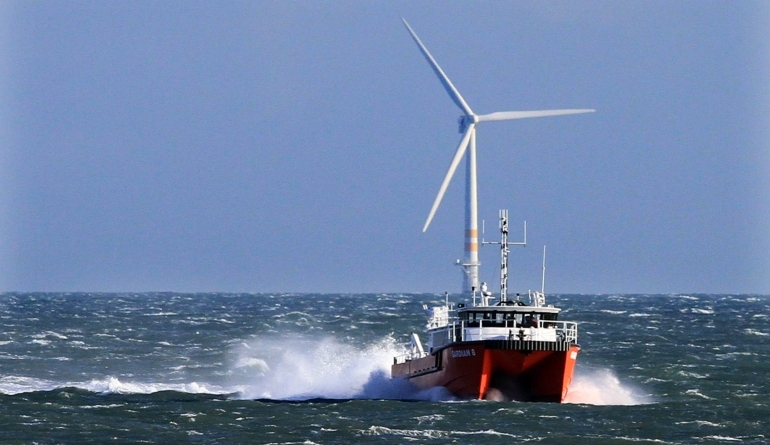 It’s clear from the photos that this route demands a very capable and comfortable offshore hull. 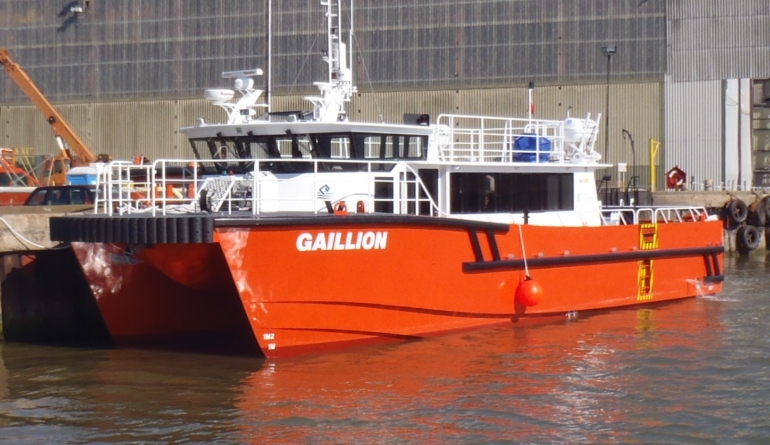 As part of a major refit to two of the vessels in 2015, GMD have designed and delivered Z Bow modification kitsets. 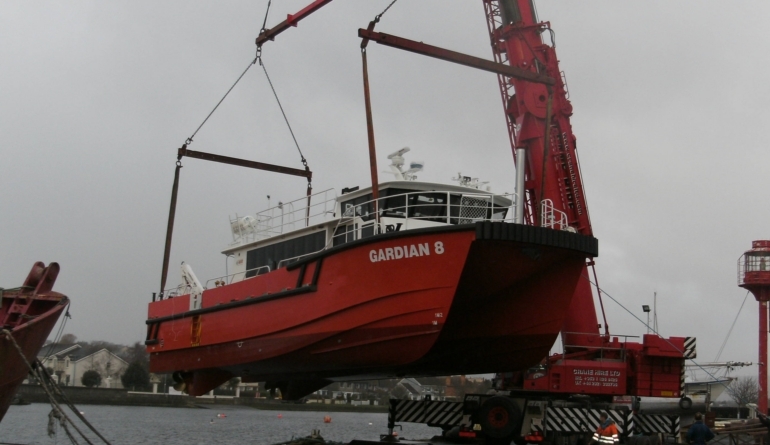 This modification will take the vessel from 20 to 22.6 metres and provide a forward cargo deck. 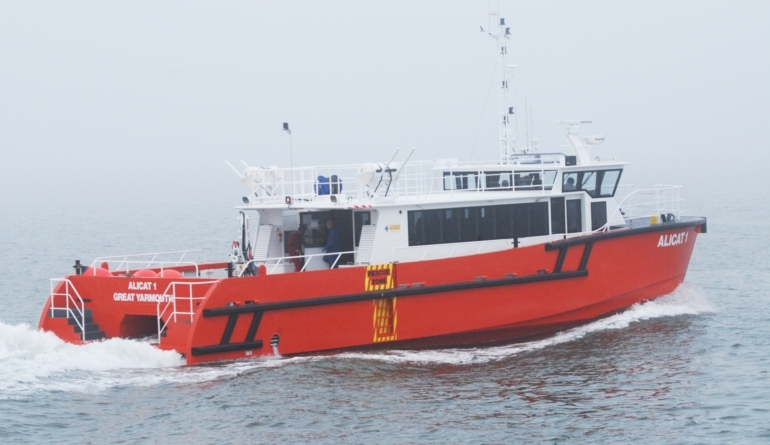 The first of the modified vessels is due for launch in December of 2015. 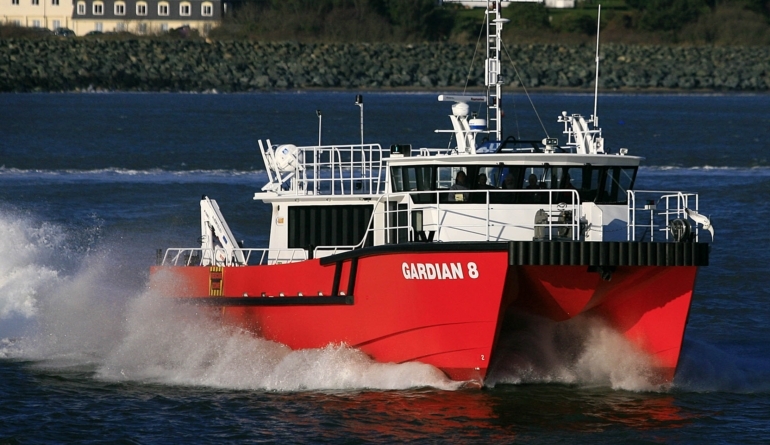 Among our valued clients are Gardline, Dalby Offshore and Rix. 2 x 1190 Us. Gal. 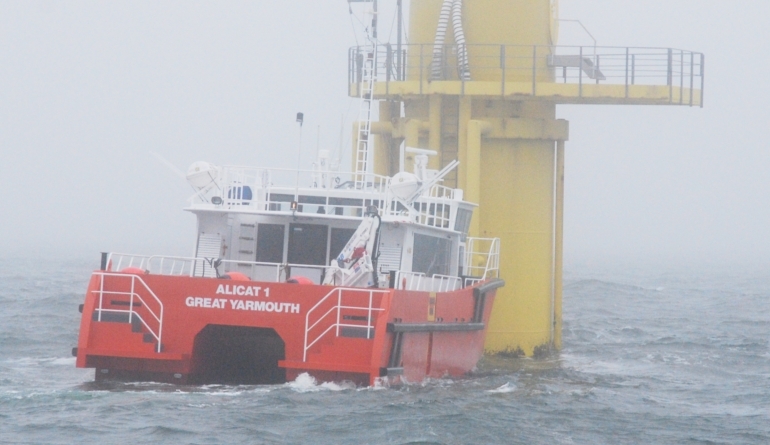 The first of these kitsets arrived at the Great Yarmouth yard in August 2009 and was launched in late May of 2010 with outstanding success. 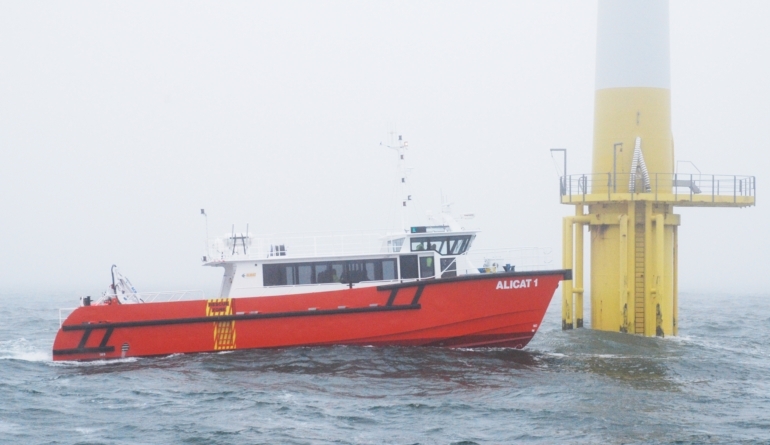 We have fitted this vessel with a removable bow module that allows the operators to exchange the fendered bow module to suit the tower/platform that the vessel will operate at for its contract period. 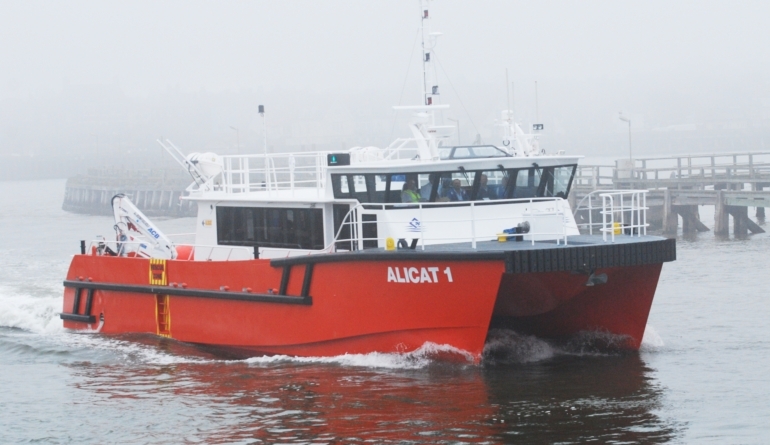 The latest version comes with extensive stern fendering and and an aft deck helm station for extended cargo transfer.